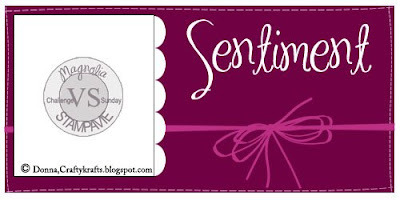 Today is the final day of the Sweet 'n Sassy Stamps Blog Hop! 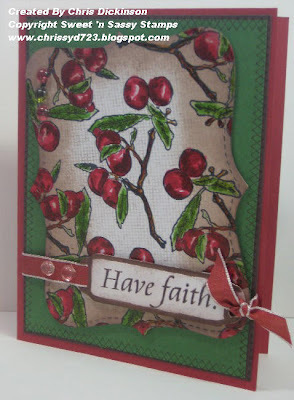 I decided to make a card using the AUTUMN BLESSINGS stamp set available at Sweet 'n Sassy Stamps AND the Trust in the LORD stamp set too! I colored it in with my Copics. I used the TOP NOTE die cut from SU, along with All in a row (retired), Canvas BG and the riding hood red taffeta ribbon too. Be sure to check out Michele's card and be on the look out for more posts by our design team in the coming month. Come back often to see more details about our upcoming Release Party. 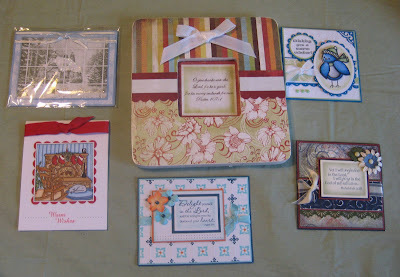 The Sweet 'n Sassy Stamps Anniversary Sale will be ending today, so be sure to check out Korin's FABULOUS specials! Have a wonderful day. Thank you for stopping by! HELLO! It is Saturday night and I just arrived home from cooking all day. 3 of my friends and I and my dd, Ariel cooked up a storm today. We made 120 meals total - 30 meals for each family to take home. These are "MOST" (refrigerator items and a lot of meat not pictured!) of our groceries at the beginning of the day. 1. A few weeks before hand we pick a cooking date and select 30 recipes. This month's recipes include: Taco Stuffed Shells, Tater Tot Casserole, Zesty Slow Cooker Chicken inBBQ, Stuffed Peppers, Slow Cooker Beef Stroganoff, Slow Cooker Chickenand DUmplings, Smothered Meatloaf, Stove Top BBQ Chicken, TacoSpaghetti, Lasagne, Marinated Pork tenderloin, Mary Pat's Chiecjen,Quick Cassoulet, Shredded French Dip, Sloppy Joes, Easy tunaCasserole, Fajitas, Roast, Garden Fresh Soup, Chili, Chicken a laKing, Chicken Pesto Paninis, Chicken Pot Pie, Chicken Tetrazzini,Crock Pot Saucy Pork Chops, Applebees Oriental Chicken Salad, BasicMeatballs, Beef Enchiladas, Cajun Chicken Strips, Cheeseburger Soup,Chicken & Corn Chowder. 2. We prepare the grocery list, breaking down amounts, etc. 4. A few days before, all of our husbands have a night out and do the BIG grocery shopping for things we need. 5. Each person does some prep work of chopping vegetables, cooking meat, etc. at home the day before cooking day. This works great for Karen, she just had a baby six weeks ago. Doesn't she look great? Melisa is so faithful. She ended up at the hospital at 2:30 a.m. with her mom, who is having health problems. Left the hospital around 6:30 to stop at home and come make meals with us. She is so faithful! Ariel was such a trooper. She came to help us out since Karen and Betsy had to leave for a a few hours to attend a meeting. Betsy is the FABULOUS host! She provided the home and helped organize this to make it all happen. Here I am, looking kind of scary! LOL I did not sleep well, so just woke up showered and showed up to cook. By the end of the day, I had spaghetti sauce spilled all over my shirt! COOKING DAY!!!! Bring all of your freezable cooking dishes, Ziploc bags, Ziploc containers etc., we are blessed because the SC Johnson Company (Johnson Wax) is here in Racine and they have an employee discount store for those wonderful freezer containers. We start between 7:30-8 a.m. and cook and clean until we are finished. Each person takes a recipe and multiplies it as many times we have decided before hand. 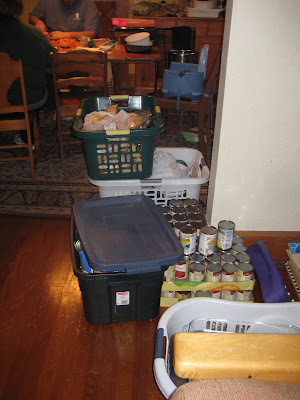 This months groceries for our once a month cooking costed each family $218- AND we have 8 packages of frozen boneless, skinless chicken breasts and 4 turkeys (80 pounds) remaining to be cooked up for meals next month and several other groceries remaining! That means next months groceries will cost us less, because we will not need to buy any poultry. Here are a few of our recipes... If you would like more, please let me know and I would be happy to share them. minutes. Keep juices for sauce. about 30 minutes until bubbly and the cheese is melted. sauce, cook on low in slow cooker. cook chicken in butter 8-10 minutes or until done. Now, I have 30 meals for the month and will be able to take my meals out of the freezer to defrost the night before. It really helps save time and eliminates the process of WHAT to make for dinner every night. The other great thing about this is you can freeze them in sizes that suit your family. If you have any other questions, please let me know. I am posting this when I am quite tired, so I can look this over and see if I am missing anything when I have more energy! Today is another BLOG HOP day! Be sure to check out 11/29: Jessica & Korin's Blog today when you are done here!!! In a large soup kettle, sauté carrots, celery and onion in butter for 10 minutes. Add consommé, 4 cups water, salt and pepper. Cover and cook over low heat for 15 minutes or until vegetables are tender. Add turkey and beans; cook for 5 minutes. In a small bowl, combine flour, Worcestershire sauce and remaining water until smooth. Stir into turkey mixture, bring to a boil. Reduce heat; cover and simmer for 5 minutes, stirring occasionally. For dumplings, combine dry ingredients in a bowl. Combine milk and egg; stir into flour mixture just until moistened. Drop by the tablespoons onto simmering stew. Cover and simmer for 10 minutes; uncover and simmer 10 minutes longer. Yield: 10-12 servings. Come back tomorrow for another peek for the BLOG HOP!!! Thank you for stopping by and have a WONDERFUL Saturday! BLESSINGS IN ABUNDANCE & THE BIG REVEAL OF NO BRACES! 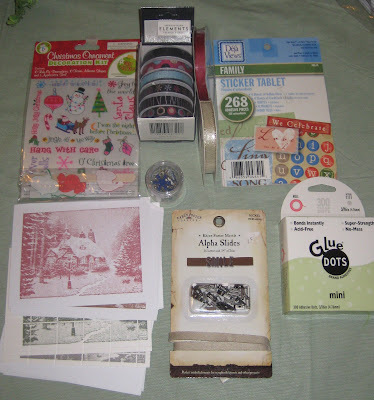 This month, I participated in a HOLIDAY GIFT EXCHANGE in the Sweet 'n Sassy Stamps Yahoo Group and my partner was Janette. If you have never seen her work, you really MUST go to her blog -it is truly beautiful. 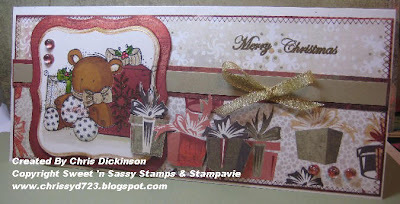 She is new on the Sweet 'n Sassy Stamps DT. I have participated in these swaps before and have been AMAZED and overwhelmed by the generosity and talent of these women!!! WOW! In these photographs, I am showing to the best of my ability what was included and beautifully wrapped. To see the TRUE beauty of these, you need to come over. LOL However, you could go look on Janette's blog for some close ups, but they really look even MORE beautiful in real life! THANK YOU SO MUCH for your generosity Janette and for sharing your talent with us all!!! I am blessed for so many reasons, but this package was FUN to open! Now, 4 years and $8000- and 2 surgeries later Ariel has had her braces taken off. This before picture was taken RIGHT before she went to the orthodontist 2 weeks ago. She looks kind of sleepy in this picture. Here she is all sassy on Thanksgiving after helping clean up the kitchen. Have a great night! Thank you for stopping by! I embossed the Bella Toile in Copper EP on Copper Cardstock. 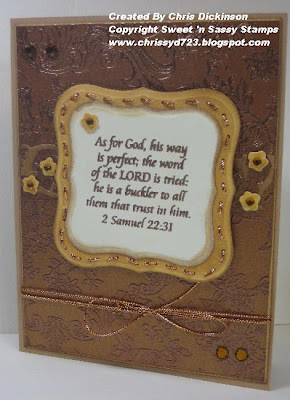 I also embossed the text from Trust in the LORD from Sweet 'n Sassy. I love this stamp set! I just got it and can see already that I will use it a lot. I used the cuddlebug die for the Creamy Caramel border and sponged that and then ran apricot appeal through it too. Copper cord is wrapped around the bottom and some coppery/mustard bling is added too. 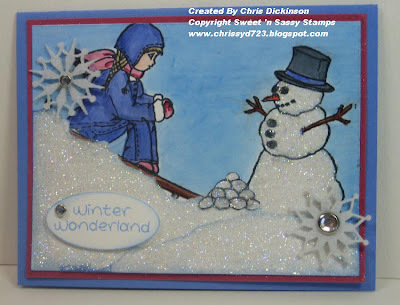 I have been stamping yesterday and today so will have more to share! Do not forget to check out the other Blogger participants. You can click on the icon on the right. HELLO FRIENDS! I am taking a survey for a conversation I am having with my 17 yo daughter. when you have time, would you take a moment to answer? The survey will be open for 6 days. Thanks! HAPPY THANKSGIVING!!!! I hope you all have a blessed day! REMEMBER THIS CARD? To see the original post, go HERE. 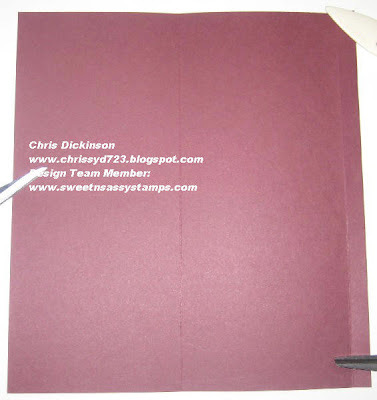 The main portion of your card should be measured at 8 1/2" x 9 1/4". You will score it on the going lengthwise on the long side at 1/2" and 4 1/2"
The sliding insert will be measuered at 4 x 9. I used the half inch circle punch to punch a half circle to make it easier to slide. Then stamp and embellish however you wish! 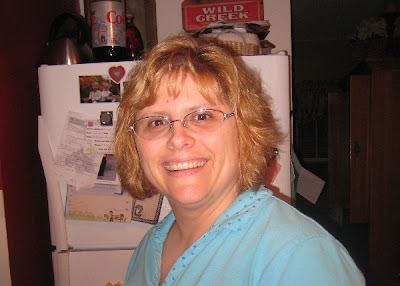 BELLI CHALLENGE DAY - BELLI'S GONE BY, SNS BLOG HOP & IT'S ALL ABOUT JOY! So I decided to celebrate BELLI'S GONE BY - you know the ones? Each week, I try to give us a challenge that will use things we have lying around our stamp rooms! With a constant flow of new things coming out, I tend to forget about the other things I have and they quickly become clutter! This weeks, Belli Challenge is to make a project using WHATEVER PAST BELLI CHALLENGE YOU WISH! 2. Make a completed project embellishing your work with the Belli of your choice. Share the link here in the comments linking to my Blog and CBC and the number of the Belli Challenge you chose! 3. When you post to Splitcoaststampers or to your Blog, be sure and put the CBC - and the Belli Number you chose as your KEYWORD and mention of the challenge - with a link! 4. I will do a random drawing for all participants and have a special pack of assorted Designer Papers for the winner! Here is a list of BELLI'S GONE BY! This card is for JOY! 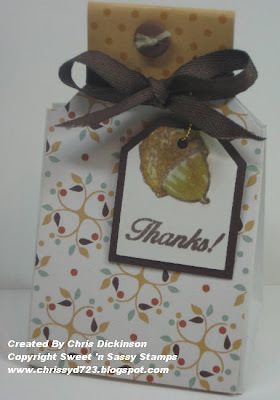 She loves it when I use Stampin' Up! and while the DP and Dew Drops are not SU - I believe this will still qualify! 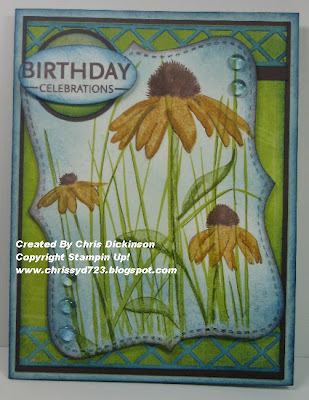 I first colored the Inspired By Nature flowers with chocolate chip, More Mustard and Old Olive and stamped off. Then I took the markers and recolored certain areas to make them have shading. I *huffed* and stamped the image on my white TOP NOTE cardstock. I stamped the grass in Kiwi Kiss - then took the markers on the thin .8 tip and highlighted a few more areas on the images. I sponged the edges of the Top Note Die with Not Quite Navy and Chocolate Chip - all other layers are sponged with Not Quite Navy only. 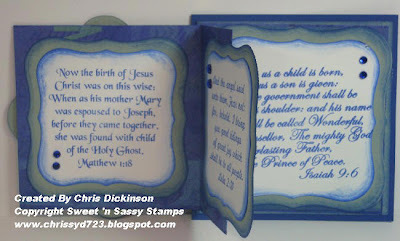 The border is cut using a cuddlebug die -and I attached it using my xyron. 1. My sisters. One of my sisters and I have had a long road of difficulties, but we are overcoming them through forgiveness and time. God is good! I grew up with 2 beautiful sisters and have 3 half sisters and a brother - one sister that I have a relationship with, the others I do not know well. 2. My faith and salvation - my faith defines everything I am about. My journey and who I am and what I am becoming. Jesus Christ has died for our sins and I have accepted His free gift of salvation and eternal life. He is my everything. 3. Sleeping through the night. I often remember those years of having babies - that season of life never seemed like it would end. My husband and I would get in so many arguments in the evening about who would get up or WHY the baby was crying. Sleep is a good thing. I do not function well with out it. 4. My MP3 player. I recently purchased one and listen to books on it from Audible.com. LOVE THIS! I used to struggle with falling asleep at night. I would lay there for HOURS and toss and turn thinking about my to do list - but now I put in my head phones - listen to a book for about 5 minutes and I am OUT! (my husband would say snoring. LOL) Since I have been doing this, I no longer toss and turn. I do have to rewind a bit in the morning. We are not having a RELEASE PARTY in December - we are celebrating all of the previously released stamp sets! Be sure to come back later today for another project. Ok, enough rambling! Thank you for stopping by! Have a wonderful day! As you prepare for your THANKSGIVING meal, be sure to prepare your heart for the day too! That is most important. The meal will last a short time, but your heart, mind and soul will be with you long after. Be sure to check out the other Challenge Chick's creations - I see I need to link them up here on my side bar! Tomorrow is BELLI CHALLENGE and we are doing something different this week! Be sure to stop back tomorrow to see what we are doing! Preheat oven to 350. Grease and flour two 9 x 5 inch loaf pans. Combine flour, pumpkin pie spice, baking soda and salt in a large bowl. Combine sugar, pumpkin, eggs, vegetable oil, and orange juice in large mixer bowl; beat until just blended. Add pumpkin mixture to flour mixture; stir until moistened. Fold in cranberries. Spoon batter into prepared loaf pans. Bake for 60-65 minutes or until wooden pick inserted in center comes out clean. Cool in pans on wire racks for 10 minutes; remove to wire racks to cool completely. Makes 2 loaves. 1. My husband's job - we are unsure as to what the future holds - but GOD knows, so today I am thankful for his job! 2. A cozy bed and my pillow. I never sleep as good without my pillow. 3. Hot water in my shower. Every day, I step into my shower - I am thankful for hot water! Some of these things may sound silly I know, but I am so thankful for each little thing! Thank you for stopping by! Be blessed today! Today is the Technique Lovers Challenges #196 and it is to try a Pop Up Gift Card! There is a tutorial with a video HERE. Although it is very simple! I used my Nestibilities Labels One dies- I just bought the Wizard and I am absolutely LOVING it! It took me 3-4 days to like it. The first 2 days, I was regretting purchasing it, but the more I am using it the more I like it. 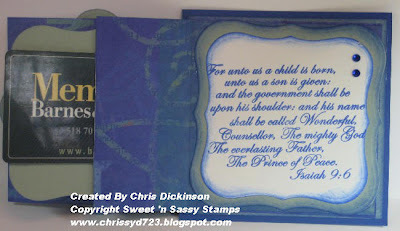 I used K&Company Mira Specialty Paper Pad that I purchased from SNS. Then threw in some Brilliant Blue and Sage Shadow for my accent paper. 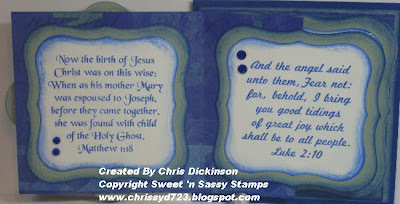 I could not resist using the Christmas Scripture set from Sweet 'n Sassy Stamps for this Gift Card Holder. I do not have a gift card at this time, but I will be buying one for my neice and nephew as Christmas comes closer - so I will use this for one of my neices. I also used a little BLING stickers from SNS too! 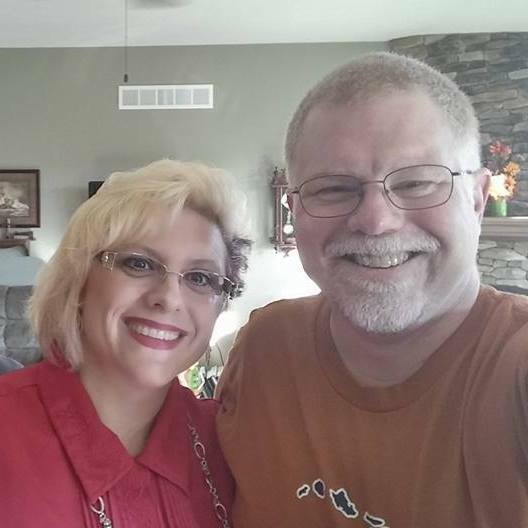 Here are a few more things I am thankful for! 2. The many online friends I have made - thank you for being a part of my life! 3. I am thankful for the SNS Design Team - not only is each person very talented, but they inspire me in their giving and prayerful ways! I am blessed to be a part of their group! If you do not know them, I would encourage you to check out their blogs and get to know them through their posts! 4. My local friendships - I am blessed with knowing so many friends where I live and in areas I lived before. They love me for who I am and if I am acting like a doody head, they let me know! There is true love in itself - when the person you call friend, understands your past, believes in your future and loves me today...just the way I am. Thank you for being a part of my life. I am blessed by you. I am not feeling very chatty, due to a bad head cold - so I will post more details later today! This is a General Grievous Noah built with out a kit - just regular Legos he had laying around. My son LOVES the Clone Wars and General Grievous is his favorite character. I keep telling him to pick a GOOD GUY - but he likes General Grievous - he draws General Grievous - he took an Art class and drew General Grievous when everyone else was drawing Still Lifes. I listen to stories about General Grievous and find scrap papers through out my house with drawings of General Grievous. This is a robot made of legos - the Lego Team had certain missions they had to complete to get a certain number of points. Each team had to have a theme that had something to do with the Climate - it became an involved Science project - Noah's team chose STATIC - and their team name was ELECTRO-FRIED. This is the competition board and the two video screens so everyone could watch as the teams competed. There were 26 teams and about several hundred people there. Here is a video of a team on their mission! is the study of world climates at the Global scale - Climatologists engage in a wide range of atmospheric research. Studies include climate variability, cloud physics and numerical modeling, atmospheric dynamics, synoptic meteorology, air pollution meteorology, and nonlinear dynamics, global warming and solutions to protect world climates on the global stage. Robots have 2 minutes and 30 seconds to complete missions on a 4' x 8' playing field. Teams earn points based on the robots performance in each of these missions. Team members interact with judges to explain robot design and programming approaches. Judges ask questions to determine team member roles and their individual understanding of the technical process. Teams research and prepare a presentation to execute in front of a team of judges. Judges ask a variety of questions to determine their understanding of the research topic. Teams are also judged on their teamwork skills and interactions. Communication, respect, responsibility, and problem solving skills are central goals part of this competition. The FIRST LEGO League mission is to inspire youngsters around the world to work together, use their creativity, and engage in hands-on, minds-on activities. Thank you for stopping by! Have a nice evening! CBCC #14 Sketch in the Challenge! Christmas Cookie Challenge & a Challenge for You! 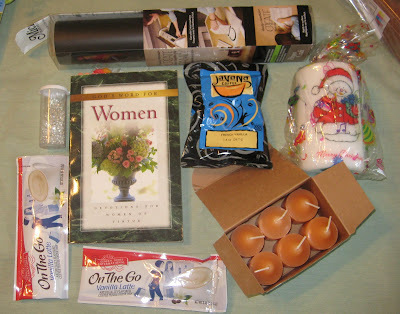 BELLI CHALLENGE #42 GIFT TAGS IN A BOOK! 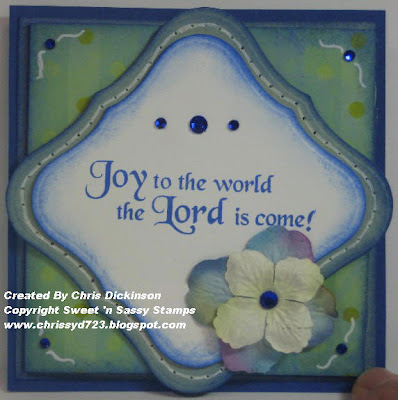 CHRISTMAS CHICKADEE for Stamp Camp!